If you ask me, Stalking Jack The Ripper is the perfect read for a dreary, dark autumn night. I read it for the Halloween Readathon and got more than I expected. Though it was not a perfect book and I did have a few issues with it, I still highly enjoyed it overall. Here’s a quick rundown of what I loved and what I loved a little less. Audrey Rose. 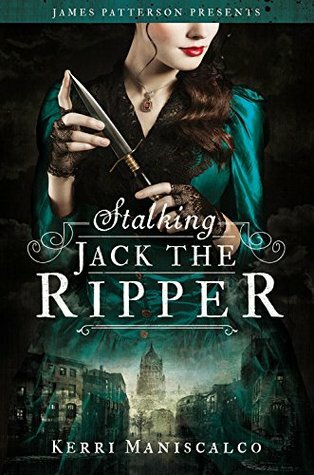 Stalking Jack The Ripper has a lovely, spunky, intelligent and brave heroine. I loved her quite quickly and enjoyed her narration a lot. I could see her as a tv show heroine, one you can both look up to and identify with that has a lot of character development to go through but you still root for every step of the way. She was a delight to read about. Thomas Cresswell and his interactions with Audrey Rose. The super-deductive and know-it-all Thomas is is the perfect Sherlock Holmes to Audrey Rose’s Watson. Together they don’t only form the perfect sleuthing, crime-fighting duo, they are also hilarious. Their funny bickering is a great balance to all the horror and gore of the story. And on top of that, they were made to be shipped. The creepy, atmospheric writing. The story of Jack The Ripper is one of those classic murder mysteries and the name itself already brings a certain atmosphere to mind. But this story was such an intriguing take on the classic and the writing really helped bring everything to life again. It wasn’t that hard to picture the misty, eerie streets of Victorian London. Especially because of the real and creepy pictures used thoughout the story. Like I said, the perfect read for a dark and dreary night. The feminism. Audrey Rose is quite ahead of her time and I did enjoy all the feminist themes throughout the book. Yes, it did feel a bit forced at times and maybe even a little too modern for that time period, but I found that I didn’t care that much about that. I loved all the girl power that both Audrey Rose and her cousin Liza demonstrated, both in their own way. The predictability. I figured out the identity of Jack The Ripper about 20% into the story. And once I figured that out, it was painfully obvious the whole time and it took quite a bit of fun from the story. I did still highly enjoy the story as a whole, but I had honestly expected quite a bit more from the mystery. So while I had a few issues with Stalking Jack The Ripper, overall I highly enjoyed it and am ready for more adventures with this delightful sleuthing duo. “Without lifting his head from his own journal, he said, “Not having any luck figuring me out, then? Don’t worry, you’ll get better with practice. And, yes”—he grinned wickedly, eyes fixed on his paper—“you’ll still fancy me tomorrow no matter how much you wish otherwise. I’m unpredictable, and you adore it. Just as I cannot wrap my massive brain around the equation of you and yet adore it. HAVE YOU READ Stalking Jack The Ripper? WHAT DID YOU THINK ABOUT IT? Loved it! I hope you love HPD! Great review! I really enjoyed this book too, especially Thomas and Audrey Rose. I can’t wait to read the second book in the series. I’ve heard so many good things about this book. I haven’t read it yet but I’m completely intrigued. I love a good historical fiction based on actual people – and that era and locale is awesome. I will read this someday! It’s definitely a fun book, and yes the era and locale are already so awesome 🙂 Hope you’ll enjoy it when you decide to pick it up! I can deal with the predictability so I think I would really enjoy this one. This sounds perfect for me! Brilly review! I’ve had this on my TBR but then I heard some mixed opinions and I have been hesitant. Knowing that you loved it though has me dying to read it again. I’ll definitely be picking this one up.